When we look for wines to carry at Selden Standard, we generally ask ourselves a few questions: Does this go well with a wide variety of foods on the menu? Are the aromatics beautiful and the flavors interesting? Is it a good value? 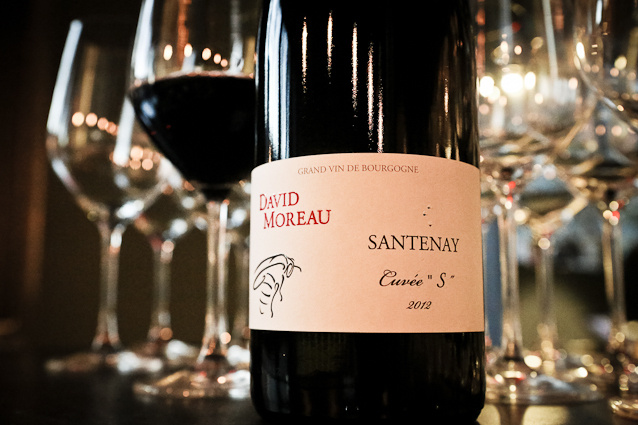 Delicious but nuanced, elegant and affordable, the Santenay “Cuvee S” from David Moreau was an easy bottle to add to our selection. Ignoring, for a moment, the excellent work of Moreau himself, Santenay is worth a quick examination. A (relatively) unheralded sub-region of Burgundy, it produces mainly reds, all pinot noir. These are widely regarded to be a bit more rustic than the wines produced not far too the north, nearer to the city of Beaune. But it might be more accurate to say that the wines are simply a touch earthier than some of its leaner regional counterparts. The less celebrated pedigree makes for some outstanding values. Moreau himself is a young winemaker, his first vintage coming in 2009, but he learned his craft from his grandparents, and the vines have been in his family for years. The “Cuvee S,” named for his grandmother Simone, comes from 50 year old vines in a vineyard called Les Cornieres. While a lot of young burgundy can be austere and difficult to drink in its youth, this is a rather expressive bottle with ample fruit. Before even tasting the wine, there are plenty of clues that this is a concentrated bottle: The vines are reasonably old. There is a high percentage of millerandes, a term referring to smaller, more concentrated grapes. Depending on the vintage, he uses up to 15% whole clusters of grapes (versus individual, de-stemmed grapes), creating an oxygen-free fermentation inside the berries, ultimately yielding a concentrated, ripe fruit flavor. Despite the concentrated fruit, there’s plenty of balance, typical earthiness, and acidity. The Cuvee S is a beautiful purple-ish red hue, and this is the sort of wine where even an empty glass will present beautiful aromatics for hours. At the moment, the only other place we’re aware you can get this wine in metro Detroit is one of the area’s finest retail shops – Elie Wine Company in Birmingham. Join us for a bottle with your next meal, or stop in and see Elie and Todd to pick some up. It’s delicious.